There’s no denying the fact that recycling and the environment will always be intertwined. This is because, the more that we recycle, the better off our environment will be. Metal recycling, in particular, can be very beneficial to our environment. Let’s discuss the connection between our environment and metal recycling in Oak Lawn. The environmental benefits of metal recycling can be seen in a number of different sectors. Metal recycling not only reduces the need for mining; it also reduces overall energy consumption, which helps cut down on greenhouse gas emissions. While mining is necessary in order to make a number of materials, it’s far from harmless. Metal mining negatively affects our environment in a number of ways, causing erosion, wiping out animal ecosystems, contaminating water, and much more. The truth is, the less mining we engage in, the better of our environment will be. How can we engage in less mining? Metal Recycling. When recycled metals are used to make new products instead of fresh metals, there is no need to extract fresh metals from a mine. This, in turn, helps preserve our environment. While the processes of recycling metal and mining for new metal both require a great deal of energy, the truth of the matter is that mining for new metal requires substantially more energy. For this reason, it makes sense to avoid mining for new ores. Our fossil fuel supply is limited, and our electrical grid can only handle so much strain. Once we’ve depleted these vital resources, we could be in a challenging situation. 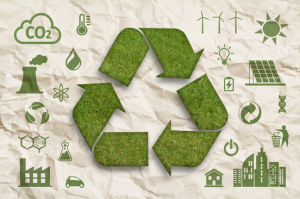 Recycling your metals is just one way that you can help minimize energy usage. As was noted above, the process of mining for metal requires the use of much more energy than does the process of recycling metal. Because of this, mining metal not only causes a rapid depletion of our energy resources, it also results in the emission of substantially more greenhouse gases. Greenhouse gases are considered by most environmental scientists to be the single biggest threat to our environment. They are, after all, known contributors to climate change and global warming. Do you want to do everything in your power to resist climate change and global warming? Recycling your metals helps make a difference. Now that you understand the connection between metal recycling and the environment, you might be wondering how you can contribute? If so, you’re probably also wondering if you have metals which can be recycled? Chances are high that the answer is yes. Metals of all types can be recycled, including steel, aluminum, iron, copper, brass, and more. In fact, you can even recycle the metals that exist inside of your electronics. These metals are known as e-scrap. Regardless of the metal you’re looking to recycle, there is an Oak Lawn metal recycling company that can help you. It doesn’t matter whether you have a small load of metal or a large load of metal; you can do your part. Are you interested in helping our environment? Do you have metal items to dispose of? If so, you should utilize metal recycling services in Oak Lawn. Where can you find such services? Right here with Central Metal Recycling. We work in both the commercial and residential sectors, helping businesses and individuals to recycle their unused metals. We offer the best prices in Oak Lawn for your scrap metal, with payments issued on the spot. Contact us today to discuss your needs!